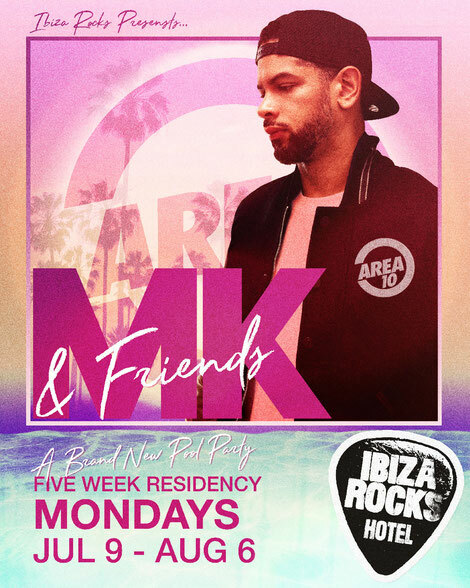 Ibiza Rocks Hotel recently announced another pool party residency with Marc Kinchen (MK), one of the industry’s longest-serving and most widely respected producers. MK will make the hotel his home this summer for MK & Friends ‘Area 10’ Pool Party on Mondays for five weeks from 9th July to 6th August. Scoring global success with his most recent hit ‘17’ which topped the UK Dance chart, (amassing over 30 million Spotify streams in the process), MK has long been known for his sound made up of piano-led melodies and chopped vocal cuts. He has remixed the likes of Rihanna, Sam Smith, Bastille and Disclosure as well as curating his Area 10 event series and performing live sets at some of the world’s biggest venues and festivals including Hideout Festival, Creamfields, WE ARE FSTVL, Pacha and Amnesia as part of his sell-out ‘17’ tour. MK joins a summer line of pool parties including Craig David’s TS5, Rudimental & Friends, Cuckoo Land with resident Sonny Fodera, Toddla T’s Steezey Wonderland, Lovely Laura with Ben Santiago, Stormzy’s #MERKY Festival and the Ibiza Rocks Hotel opening pool party weekend headlined by Craig David and Rudimental & Friends.